. : Optics & Photonics Focus :: Holography Goes Beyond 3D :. Particles in the nanoworld have mostly been modeled on unrealistically ideal shapes. A recent research takes advantage of a more complex and realistic model of the complex 3D shape of a nanoparticle. A new technique for manipulating single immune system cells could revolutionize our understanding of their tactics and eventually lead to new strategies for mobilizing our body’s defenses against disease. 3D vision devices are one of the biggest technology gimmicks of the day. Holography is an inherently three-dimensional technology that now supports full color. It could, therefore, provide the ultimate 3D experience, with images and movies appearing identical to the real world… and without the need for 3D glasses. A 3D full color hologram of an apple. 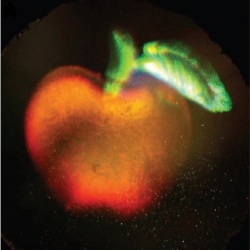 The image shown here is a photograph of a hologram that records the three dimensional structure of an apple and leaf in full color. This frame is part of a video that demonstrates how changing the viewer’s perspective of the hologram alters its appearance, as would happen when viewing the original object. Image Courtesy: Satoshi Kawata. In 1987 the TV series Star Trek presented the world with the Holodeck — a room that by means of holograms can construct an environment that is indistinguishable from any desired reality. This is, of course, still sci-fi; however, current 3D technology is quickly advancing with several commercial products already available. Researchers at RIKEN, in collaboration with Tokyo Denki University and Osaka University, all three in Japan, have now brought us one step closer to recreating the Holodeck experience by developing a full color 3D hologram technology based on surface-plasmon polaritons. We see a 3D world because our eyes are placed slightly apart. Our brain, therefore, reconstructs two slightly displaced images of the same scene, which we interpret as depth. This neurophysiological basis to 3D vision is exploited by most common 3D technology. You may remember the blue and red glasses from your childhood that made certain images pop out of a book or the large 3D goggles that were employed in 3D IMAX cinemas. Each of these technologies, and even the relatively comfortable almost sunglasses-like 3D glasses common at movies today, attempt to simultaneously show each eye a different image, each with a slightly shifted perspective. The obvious limit of current 3D technology is that it is based on delivering an image to each eye. While this can successfully produce the illusion of depth, such images are about as sophisticated as a standard photograph. For example, the viewer is unable to choose which object is in focus, and unable to change the perspective from which the object is seen. Can such limitations be overcome? Holography, invented in 1947 by Dennis Gabor, and for which he was awarded the 1971 Nobel Prize in physics, may be the answer. In short, a hologram goes beyond a traditional photograph by recording the interference pattern between a reference beam of light and the light directly scattered off the object. When the reference beam is shone again on a developed hologram, the pattern of the light originally scattered by the object is recreated, allowing our eyes to see the object just as we would if we were looking at it directly. Since the scattered light is indistinguishable from the original light, it is inherently three-dimensional; hence any part of the object can be viewed from any perspective, including objects that may be hidden when viewed from certain angles — and all this is achieved without the aid of glasses. On the downside, holograms are more difficult to create and sometimes more difficult to view than standard photographs and, perhaps more importantly, until now holograms have not been available in full color. The new holographic technique, named 3D Surface-Plasmon Polariton Holography, developed by the researchers in Japan overcomes the color and visibility limitations of traditional holograms and, therefore, is "a very promising approach to holography," as Thomas Ebbesen, at the University of Strasbourg in France, says. What makes this holographic technique more powerful than standard holography is a thin metallic layer, and its optical properties, coating the top of the photoresist. When light of the right color hits the free electrons in the thin metallic film some electrons start oscillating. These oscillations are passed to the neighboring electrons, forming an electromagnetic surface wave termed a surface plasmon. The new technique relies on a key property of surface plasmons — for each color of light, this phenomenon can happen only at one unique angle between the incident light and the metallic film. Exposing the hologram to three colors of light — the standards red, green and blue — allowed researchers to store the color information of the object. When the developed hologram was then illuminated with white light at three different angles, the three colors (red, green and blue) of the excited surface plasmons made the hologram appear bright and in full color, just like in all digital displays today. Satoshi Kawata, a professor at RIKEN and the leader of the research group that has developed this technology, sees endless applications ranging from medicine to advertising. "This new technology could be used for medical applications, to display an image of a bone or an organ taken with an X-ray CT scan in three dimensions for medical diagnosis that could benefit doctors and patients alike; or for the virtual representation of new products for salespersons and customers; or even for toys and games for kids and young people." Kawata continues in suggesting hopes of dynamic holograms in the future, adding that "(holographic) movies are one of the most exciting future projects for us." Much progress has been made in hologram technology, but open challenges still need to be overcome. Unlike photography that can be done by anyone, anywhere, holography requires a relatively large optical setup and can generally only be done in a laboratory. There are amateur holographers, but they need to be very skilled as optical engineers and photographers in order to create high quality holograms. While the new holographic technique improves the visibility of the hologram as well as adding color, these holograms are even more difficult to make and require additional equipment. Be that as it may, Ebbesen contends that "with modern fabrication tools it should be possible to make such plasmon holograms fairly competitive with existing technology." ZL is currently working towards his doctoral thesis at The Institute of Optics at The University of Rochester, Rochester, NY (USA). Miyu Ozaki, Jun-ichi Kato & Satoshi Kawata, Surface-Plasmon Holography with White-Light Illumination, Science (2011) 332, 218-220 (link).